With cable and satellite TV channels airing so much advertising and recycled news, do you feel that you can’t ﬁnd anything good to watch without constant and prolonged interruptions? Fortunately, you can watch movies and TV shows whenever you want and without those annoying interruptions, thanks to several options for rental or even free video—on the Internet, from a rental kiosk, or from an envelope. You don’t have to be a computer whiz to rent high-quality videos. Some movies may be available at your public library. Another easy solution is renting films on DVDs from a local video rental store such as Blockbuster, but since these outlets maintain far fewer locations with every passing year, you should keep your options open. Two good ones are Redbox and Netflix. Redbox is a sensible marriage of vending machine and video rental store. This growing company has nearly 30,000 self-service machines in the United States at places you probably already visit: drugstores, convenience stores, grocery stores, and large discount stores. As of 2012, a one-night rental cost a little more than a dollar, and you can check out and return DVDs at a Redbox very easily. It’s as simple as using the ATM at your bank: Just use the buttons and display screen on the front of the dispenser to find a movie you want to rent, insert your credit or debit card, and take the DVD when it appears. Remember to put your card back into your wallet before you walk away and to return the movie the next day so you won’t be charged additional fees. With Redbox, you even have the option of going to the company’s website, reserving a title in advance, and picking it up at the nearest kiosk. select the ones you want to watch and add them to your “queue,” and then Netflix will mail the DVDs to you in the order you choose. In addition to classic movies and recent releases, you also have the option of renting DVDs of your favorite TV series from Netflix. Other categories of Netflix rentals include sports and fitness, music and musicals, and documentaries. Netflix also gives you the option of paying a little extra to rent Blu-ray Discs (BDs). BDs are special DVDs that display incredibly high-quality images on your HDTV screen. But increasingly, people with high-speed Internet service skip the wait for red envelopes and use the Netflix “streaming” option. You can instantly watch some movies and TV shows on your computer screen, or on a TV, DVD player, receiver, or game console that is designed to access your Netflix account. If you own a tablet device or a smartphone, you may even be able use them to watch Netfl ix content. The next time you’re shopping for a TV or DVD player, be sure to ask if it can connect to Internet-based services such as Netflix. For free videos, you can use your Internet connection and your computer to go to YouTube.com or Vimeo.com. At these sites, you can sign up for free accounts and browse through countless videos that people and organizations have made available. You won’t find much in the way of movies or TV shows on these sites; what you will find is everything from nature and technology films to sports and history videos to silly clips featuring dancing dogs and laughing babies. The video-sharing website YouTube, which didn’t exist until 2005, has grown so fast that in an average month people now watch eight billion videos there. YouTube video controls on your computer let you pause, replay, or stop the action, as well as mark a video as one of your “favorites” so you can easily find it again in the future. If you own a digital camcorder or any video recording device that lets you transfer its fi les to a computer, you’re just one step away from sharing them with the world or a few selected friends. Simply go to YouTube.com and sign up for a free account. In addition to helping you organize your favorites from the vast universe of YouTube videos, your account allows you to publish your own videos in just a few easy steps. It’s as simple as clicking “Upload” and finding the place on your computer where you saved your personal video of a family event or travel highlight, or that exclusive footage you shot of Bigfoot or the Loch Ness Monster. Whatever you choose to upload, you’ll be able to control whether everyone on the Internet or just the few people you choose can see your video. You can mark it “Private,” in which case you can send a link to up to 25 people who can watch the video. Some prefer to restrict who can see family videos in order to protect their privacy. However you decide to share your videos on YouTube, remember to abide by copyright laws. As long as the subject of your video is original, you don’t have to worry about copyright infringement. But keep in mind that you shouldn’t use a commercial recording of popular music as the soundtrack to your video or upload recordings of TV shows, movies, or other video that you didn’t create. The website Hulu is a great place to watch television shows at your convenience—it’s even free, up to a point. Using your computer, go to Hulu.com and sign up for the basic, free membership to learn why use of this site has become one of the fastest-growing video habits in America. You may see a computer message that you need a “plug-in” to play an Internet video. If you are visiting a reputable website—such as a major news, business, or shopping site— follow the on-screen instructions to update your browser (the computer program you use to see websites). The video should play after the process is complete. You can also enjoy past hits such as Green Acres and Alfred Hitchcock Presents. You’ll encounter short, unskippable ads, but it’s a small price to pay for free video. After you get the hang of basic Hulu, you may want to try Hulu Plus. 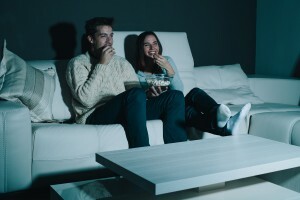 It costs a few dollars a month, but it dramatically expands your options: high-definition video for some content; all of the episodes from several shows; and the option of watching your Hulu programming on not only a computer but also a wide range of Internet-capable gadgets such as tablets, smartphones, game consoles, and many late-model TVs and DVD players. Your living room can become any place in the world to which you can carry one of those gadgets. The commercial success of Netflix, Hulu, and other Internet-based video services didn’t go unnoticed by online shopping giant Amazon. Now, in addition to buying books, electronics, and even paper towels on Amazon.com, you can view selections from a growing library of video content. To do so, you’ll have to subscribe to Amazon Prime, a roughly $80-per-year service that also covers two-day shipping on all your physi•cal Amazon purchases, as well as access to Amazon’s giant library of electronic books, or e-books. E-books are digital copies of printed books; Amazon’s inventory can be opened and read on the company’s own Kindle electronic reader. So far, Amazon’s movie and TV library includes about 10,000 titles—not nearly as many as you’ll find on Netflix. If you happen to buy the new Amazon Kindle Fire tablet computer—an entry-level competitor of the more powerful iPad—Amazon Prime and its video library may be a good investment. You can also watch Amazon’s videos on many Internet-compatible TVs and TV-related gadgets, as well as tablets and other computers. The more you dive into the online video world, the more you’ll encounter gadgets with quirky names that off er viewing options unimagined just a decade ago. Anyone who wants to find great video (and music) with a minimum of technical fuss and without buying an advanced machine should consider inexpensive TV devices from Google, Apple, Roku, and other companies. These boxes, which typically cost under $100, can be found at electronics stores and many of the big discount stores. Setting them up is easy: You’ll physically hook the box up to your TV with one or two cables, go through a guided process of connecting the box to your high-speed Internet service, and within a few minutes, you’ll be browsing through scores of viewing and listening options. But don’t expect to get a TV box and easily tear yourself away from your cable TV subscription. You could do it, but keep in mind that boxes such as Google TV and Apple TV don’t include access to local stations. If you don’t mind accessing those stations with a separately purchased digital antenna and switching back and forth on your TV remote between the box and antenna, you may be okay, though you’ll likely find yourself missing some programming to which you had access with cable. The Slingbox, from Sling Media, is a specialty gadget that lets you—or a relative or friend—view and even control your TV or DVR from any Internet-connected device anywhere in the world! It’s ideal for following your local sports team or news while you’re traveling. So which of the leading boxes is best for you? That depends. If you are a heavy user of the iTunes music service, Apple TV is worth considering because it gives you easy access to the music you have already purchased from that outlet. Google TV and Roku are less expensive and each has its own exclusive programming. With most of the boxes, you’ll be able to subscribe to premium sports packages for NBA and Major League Baseball games, as well as free Internet radio. The best way to choose is to look at the list of programming available on each box and compare it to those of the others. Once installed, the devices all work in about the same way. Thus, what really matters is the programming you’ll be able to watch. • C-SPAN’s video library. On your computer, go to C-SPAN.org and browse the public-service political site’s vast video library of speeches, hearings, interviews, and more. You can select videos from popular C-SPAN programs such as Booknotes or American Profi le, or simply use the search box at the top of any page on the site. Try searching for “Winston Churchill” or “Abraham Lincoln” for samples of the massive free library of viewing material. • NASA. There are two great ways to watch free, high-quality video from NASA. First, open your Internet browser and navigate to NASA’s YouTube channel, at YouTube.com/NASATelevision. The most recent video highlight from the space agency will play automatically, and you’ll see a button you can click to “Subscribe” (for free) to be notifi ed by e-mail when a new NASA video is posted. The other option is to go to NASA.gov/NTV and explore the rich variety of videos and presentations on the home page. • Your favorite news network’s website. Whether your TV news network of choice is one of the cable news giants or a traditional TV network, its website is loaded with free video. From your Internet browser, go to CNN.com, FoxNews.com, MSNBC.com, NBCNews.com, CBSNews.com, or ABCNews.com and look for a prominent “Video” link on the home page. It’s a great way to explore the stories you want to see if you missed them on air or just wish to watch them again.